Dr. Zhang joined the Department in 1992. He received his M.S. and Ph.D. degrees from Tokyo Institute of Technology in 1985 and 1988, respectively. He was later with the Laboratory for Manufacturing Processes and Materials at Oklahoma State University. Dr. Zhang’s primary accomplishments lie in research on machining of advanced materials and design of critical machine tool components for precision manufacturing. 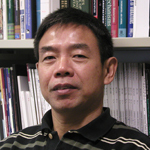 He advanced theories of grain pulverization and 3-D cracking in ceramics grinding. He designed a linear piezomotor drive which has high resolution, high stiffness, and large load capacity, and he invented a vacuum-hydrostatic shoe that is effective in lobing and chatter control in centerless grinding. He is a corresponding member of the CIRP, as well as a member of ASME, SME, and JSPE.